Engine Work, Electric & Paint. Motorcycles are fun to ride in Florida almost all year round. Keeping a well maintained bike for both rain and shine can be tough. Reinhardt’s motorcycle repair in Tampa can help you keep your bike running great. 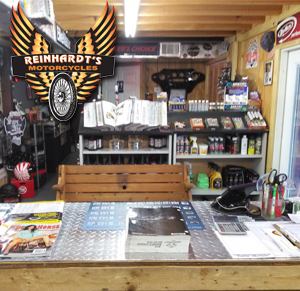 Reinhardt’s knows that you value a good motorcycle mechanic just as much as we appreciate you as a customer. Walk ins are always welcome for routine maintenance. If you are looking for a preferred time, please call 813-909-2299. Reinhardt’s Motorcycles is an independent motorcycle repair shop located on N Dale Mabry Hwy. Reinhardt has been fixing motorcycles in Tampa for 16 years. A majority of bikers believe that Reinhardt’s is the primary Tampa motorcycle repair shop and swear by his work. Oil changes, tune ups, engine work, belts, tires, accessories and more. Reinhardt’s is dedicated to high quality work by mechanic craftsman working to promote your safety with every turn of the wrench. Our customers are family. Drive in service is available for more favorable times please call ahead. Hope to see you soon at Reinhardt’s!